Tannoy DC10T review | What Hi-Fi? and dynamic speakers to date. It’s a bold claim considering the company’s roll-call of excellence, but listening to these towers, we get the enthusiasm. big rooms and high volume levels. – and that’s exactly what you get. the sense of ease and the feeling of confidence that good-quality, large-capacity units impart to the bass. are hard to do without. is the agility and definition on offer. of bass notes that allows the DC10Ts to reveal the low-level acoustic clues that define say, the size of a concert venue. pair sound more like a single driver. It works well, with the DC10Ts’ controlled dispersion and seamless integration producing a stable soundstage, providing a certain amount of care is taken over their positioning and toe-in. of constraint in the speakers’ sound. can never be accused of. the increase in sonic intensity is as relentless as it is controlled. punch when the music demands. and delicacy. This might only be a simple recording but it’s all too easily spoilt by speaker that lacks finesse. They’re easy to partner for the most part, too. Just feed them a high-quality signal from an amp that can make the most of their attributes and all will be fine. A high sensitivity of 92dB/W/m means that a multi-hundred-Watt monster isn’t needed to produce high levels in most rooms, but if you have one of sufficient quality, the DC10Ts are more than happy to oblige. What about build? It’s as good as you’d expect. The finish on our gloss dark walnut pair is lovely, as it is on the gloss cherry and black alternatives. Of course, when you get to this price level, absolutely everything has to be beyond reproach – and here it (mostly) is, from the high quality of the speaker terminals to the neat way the optional (£200) plinths fit on. Our only complaint is that some of the threaded inserts for the floor spikes weren’t as well machined as they should be. Our plinths are very early samples, though, and Tannoy is aware of the issue. product by the time you read this. and a more convincing tonal palette. that come close to matching the dynamic envelope, authority and sheer engagement of these big Tannoys. and it’s really hard not love them. Tannoy says the Definition DC10T floorstanders are its most accurate, revealing and dynamic speakers to date. It’s a bold claim considering the company’s roll-call of excellence, but listening to these towers, we get the enthusiasm. These are big speakers meant for big rooms and high volume levels. The doubled-up 25cm drivers (10 inches in old money) suggest loads of bass – and that’s exactly what you get. There’s something deeply impressive about the way a large bass driver produces low frequencies. Smaller drive units – many of the competition tend to use 16.5cm drivers – just can’t match the sense of ease and the feeling of confidence that good-quality, large-capacity units impart to the bass. Once heard, these characteristics are hard to do without. Play a bass-rich recording such as Time from the Inception soundtrack and it’s enough to bring a slightly crazed smile to our faces. We expect – and get – lots of bass weight and authority. What’s less anticipated is the agility and definition on offer. While they’re perfectly happy flexing their muscles, these speakers also give impressive insight into the sonic texture of low frequencies and crisply define the leading and trailing edges of notes. It’s this ability to track the envelope of bass notes that allows the DC10Ts to reveal the low-level acoustic clues that define, say, the size of a concert venue. Tannoy’s engineers have been clever in their driver configuration, too. The DC10Ts use the company’s trademark dual concentric drivers, which puts a tweeter right in the throat of the treated paper pulp midrange unit . The idea is to make the pair sound more like a single driver. It works well, with the DC10Ts’ controlled dispersion and seamless integration producing a stable soundstage, providing a certain amount of care is taken over their positioning and toe-in. Like just about every big speaker, these Tannoys thrive on having space around them. Put them too close to a back wall and the low frequencies gain a little too much weight. Tannoy supplies foam bungs to block the two rather large rear-firing reflex ports, and this helps to control bass in a close-to-wall position. However, the downside is a degree of constraint in the speakers’ sound. And constraint is something that this speaker, when working well, can never be accused of. The DC10Ts are immensely dynamic when the music demands, swinging from the quieter sections of Mahler’s Symphony No.2 to the peaks without any hesitation at all. But don’t worry, the increase in sonic intensity is as relentless as it is controlled. There’s plenty of attack on offer too. These Tannoys are as happy hammering out Metallica as they are Mahler. They have the agility and precision to follow a fast rhythm track, and the power to deliver monster punch when the music demands. For all the dynamism and muscle on show, though, these Definitions still have a cultured side. They’re subtle when required and handle the nuances in Curtis Mayfield’s vocal track on I’m So Proud with considerable skill and delicacy. This might only be a simple recording but it’s all too easily spoilt by speaker that lacks finesse. These Tannoys are relatively well balanced tonally, though they aren’t the most refined performers we’ve heard. Their high frequencies fall a little short of ideal in terms of sweetness. Fortunately, they remain on the right side of acceptable when replaying harsh recordings. They’re easy to partner for the most part, too. Just feed them a high-quality signal from an amp that can make the most of their attributes and all will be fine. A high sensitivity of 92dB/W/m means that a multi-hundred-Watt monster isn’t needed to produce high levels in most rooms, but if you have one of sufficient quality, the DC10Ts are more than happy to oblige. 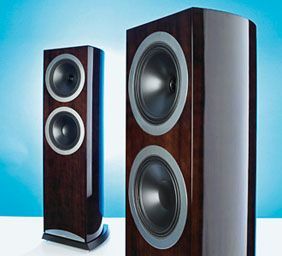 Of course, when you get to this price level, absolutely everything has to be beyond reproach – and here it (mostly) is, from the high quality of the speaker terminals to the neat way the optional (£200) plinths fit on. Our only complaint is that some of the threaded inserts for the floor spikes weren’t as well machined as they should be. Our plinths are very early samples, though, and Tannoy is aware of the issue. There’s no doubt that there are some great speakers available for this kind of money. You can certainly buy something with greater refinement and a more convincing tonal palette. However, we’ve heard few rivals that come close to matching the dynamic envelope, authority and sheer engagement of these big Tannoys. These are speakers with a big heart, and it’s really hard not love them.